NEW YORK, New York, August 25, 2009 – Miracle Corners of the World (MCW) announced today the expected departure of a twenty-foot container of donations from New Jersey to Rwanda at the end of August. Packed with dozens of boxes of supplies, the donations will support programs at MCW’s new youth center in the Bugesera district, approximately 30 minutes outside Rwanda’s capital Kigali. Modeled after MCW centers in Tanzania and Sierra Leone, the new MCW center will host a variety of activities including information technology (IT) education, social entrepreneurship classes, arts and culture activities, early childhood education, language training, and trauma counseling. Longtime MCW supporter Everlast Logistics donated storage space at its warehouse in New Jersey to house the donations. Frances Kim, an MCW volunteer, helped collect and deliver the donated goods to the warehouse and to pack the ocean freight container. 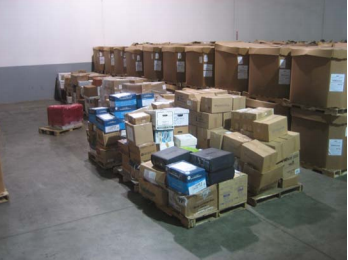 The container includes several hundred boxes of books from McGraw Hill Companies. The books will support a new library at the center. Computers to support a computer lab were also included. Claire Umubyeyi and other Rwandans living in the United States contributed books and computers to the container. Barbara Hirten, a Long Island middle school teacher, added school supplies. Syracuse University donated computers and Lyndon Community College, in response to a request from MCW advisor Dr. Cathy DeLeo, contributed sports clothing and books. About Miracle Corners of the World (MCW) Miracle Corners of the World (MCW) is a non-profit organization that empowers youth to become positive agents of change, to improve their lives and contribute to their communities. Based in New York, MCW serves youth worldwide through leadership training, community development, oral healthcare, and partner initiative programs. MCW established an oral healthcare program in Tanzania in 2001. Since then, MCW has facilitated dental outreaches, established a dental clinic in Kipera, Songea, and taught teachers about dental hygiene and prevention. For more information, visit www.miraclecorners.org.